Which flower does Carmen throw to Don José, the hapless officer whom she bewitches, drags into the sierra to become a smuggler, throws over for a bullfighter, and turns into a murderer when she would rather die free than go back to him? It is neither a Gypsy rose nor an Andalusian carnation. Carmen has planted a bunch of cassie flowers between her breasts; she holds a sprig in her mouth. Beware the tiny, unassuming golden blossom: it is far from innocent. There is something of the sternness of the original Carmen – that of Mérimée’s short story – in Dominique Ropion’s composition for Frédéric Malle. Under the promise of sun between spring clouds – the acacia farnesiana has an early blossom – there are puddles and mud. This isn’t clean spring: its freshness is deceptive, as is its warmth. Cassie, the star ingredient, smells of many things: wet cardboard – a trait it shares with iris --, balsamic wood, cinnamon and bitter almonds. Paired with mimosa and the sweet metallic sheen of violet, it gives off something leathery; indolic jasmine draws out the animal in it, just like Carmen made José forsake mother, fiancée and rank with her wiles. A slash of cumin dirties it up even further with its hints of human rankness. Yet throughout it remains fresh as spring, with a heliotropin-like powdery sweetness, which makes it all the more deceptive. 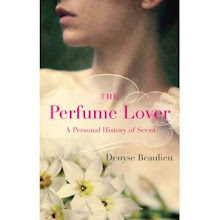 In her beautiful review, Marina from Perfume-smellin’ Things calls it unchaste, and that it is, under the wonderfully complex and smoothly classic composition which holds it together: this femme fatale doesn’t feel the need to show cleavage. The whiff you get when she moves her skirts – has she been rolling around in the earth? – is enough to leave you wondering. It could be as innocent -- on some skins, it is – as a woman who would choose freedom over lies. 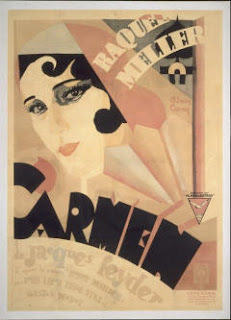 Image: Poster for Jacques Feyder's Carmen (1926), starring Raquel Meller. Hands down, one of the most beautiful perfumes on the market. I don't entirely get the Carmen analogy but your research is impeccable. I've always seen this as more Léa in Colette's Chéri. Hi C. Ah, Léa... one of my favourite fictional characters, and not without her own sternness. 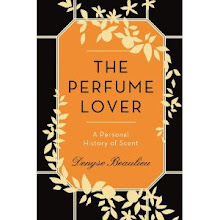 Although knowing Colette's fondness for jasmine I'd have seen her more in that type of fragrance...The riff on the cassie flower is what brought up the analogy to Carmen, of course. You can take it or leave it, but Une Fleur de Cassie is definitely an outstanding composition. I am adrift in the associations you've woven with Carmen and Lea, two of my favorite temptresses. It makes me want to smell une fleur de cassie again. Do you wear the cream, too? Cait, I'm not surprised you love those two characters as well... I've smelled the cream but I don't have it. I don't wear UFdC often enough, and I'm afraid it would go bad, but I've had a sample and both the texture and fragrance are wonderful. Dear D -- UFdC was the first niche fragrance that really made me "get" perfume, and understand that a truly artful perfume is more than just a pleasant smell. The first few (dozen) times I tried it, I was put off by the voluptuousness and the skankiness -- and yet, I kept getting pulled back to try it again and again. Eventually, I "got" it, realized it was love, and ended up buying a bottle. It's not something I feel like I can wear out of the house often, but I can't bear to be without it. I'm veeeery impatiently awaiting a large decant of this from the TPC. I fell in love with this very unexpectedly, because cumin is definately not my thing. Thanks for the review! Jarvis, you know it's strange, I don't really actually get the skank in this, in the sense that it never registered as something that could bother me in any way. Cait of Legerdenez gave me a sample and it was love, then I bought a decant and it was more love, and then I got the bottle for my birthday: bingo! Aimée, I don't get much cumin off this. But then, it's used in a very different way to, say, the way Lutens and Sheldrake use it to dirty up Fleurs d'Oranger, for instance. In UFdC, it's deep inside the blend. Enjoy your decant! Everyone seems to be commenting in english, so I'll do the same! I'm glad I managed to inspire a post with my sillage, it's true it was somewhat overwhelming! Now I've been wearing Cassie for 4 days in a row and though the sillage has been less prominent all I can say is this is truly a wonderful scent. I can't see the skanky side of it either, it's just beautiful in a nature godess kind of way! LisaCarol, I'm sure you'll enjoy it for a long time to come. I've been trying out Dans Tes Bras: I'll be writing a new post about it soon. And thanks again for the inspiration! Although people complain of its skank factor I can't say that I perceive it as such which makes me realise that we who love it are perhaps oblivious to the weird factor that it generates (?). Surprisingly it reminds me of some facets of the classic Madame Rochas in the older versions (that smooth woman-ness), also of Apres L'Ondee and its own use of cassie. I think I will upgrade to a big bottle over my little one. The body butter is unctuous and decadent and an excellent way to wear this! Helg, I know you're also a UFdC lover.. I'm glad to know I'm not the only one that doesn't detect anything malodorous about it. I wonder if it's a matter of culture (though that's a minefield I would rather not venture in). Your comparison to vintage Madame Rochas is interesting: I had a bottle of it but gave it to K. who adores it (I was in my aldehyde-aversion phase). Her taste for both could confirm your idea. As for Après l'Ondée, it seems to be an inexhaustible source of inspiration for modern perfumery, at least for Frédéric Malle's perfumers!